April | 2015 | Can Men Cook? This is one of those cheaty mid week meals. A la Delia Smith. (I remember her being vilified for her series and book “How to Cheat”. But most meals you go out for are similar to this…). As ever, Delia was right to make us think that sometimes the prep can be done by someone else. Life’s to short to stuff a mushroom as (I think) Mary Berry said. How do you make sure the loin steaks don’t dry out? I am sure pork doesn’t have the flukes and worms in it that make us overcook it anymore – but I do like it cooked through still. As you can see, I put some apple pieces around it. 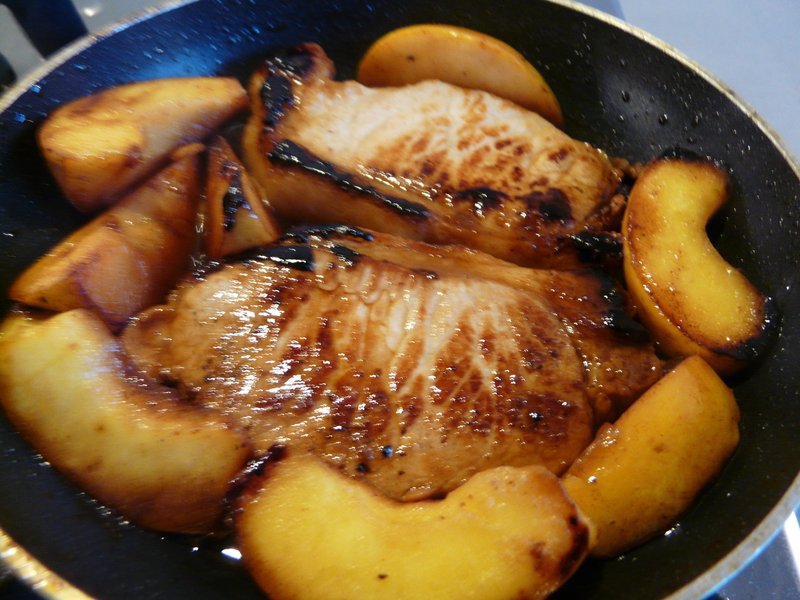 This was a week old, slightly wrinkly apple, that was transformed into something lovely by being cooked in the steaminess around the pork. I added a glass of cider near he end, switched it down to very low, and stuck a pan lid on this very small omelette pan. The rest of the bits are obvious here. The spinach? One of those £1 bags, steamed in the microwave in the bag (washed and ready to cook – cheating!). 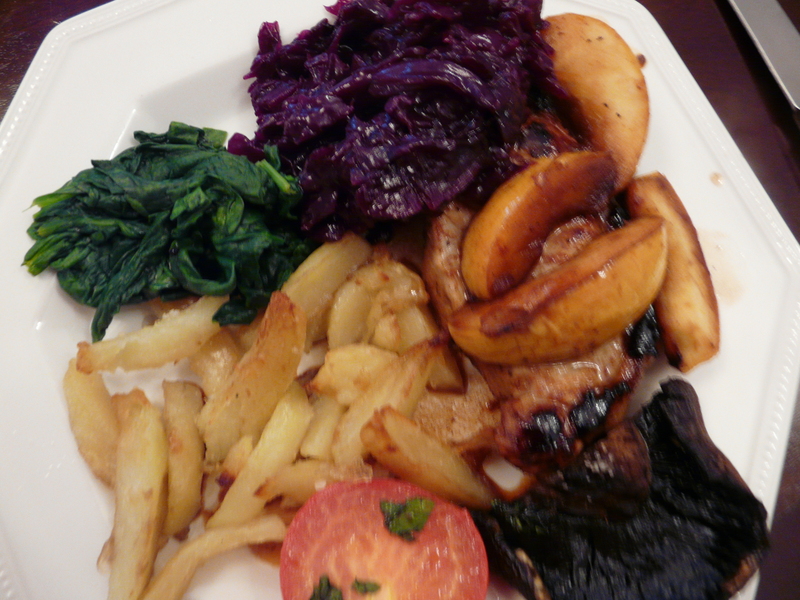 Red cabbage – an extra side with a £10 meal deal. The chips – King Edwards – oldish, hard peeled, sliced into chips and microwaved for 5 mins before 25 minutes in the oven – with the tomato and mushroom placed in there with 10 minutes to go). As you can see, the meat is almost lost beneath the apples! OK – this was Janie’s idea, as I was having a bit of heavy old dentistry during the day. 100 minutes in the chair is long enough for anyone. Even with a mouth as big as mine! It’s not quite invalid food – but nothing hard to damage the temporary crowns! I made it – never done so before, so had to look at a recipe (swoon…). Changed it a bit though. Sainsbury (other high street stores are available) do a “Fish Pie” pack at #3:50. Enough for 4 people. As ever with any cooking, timing is key. 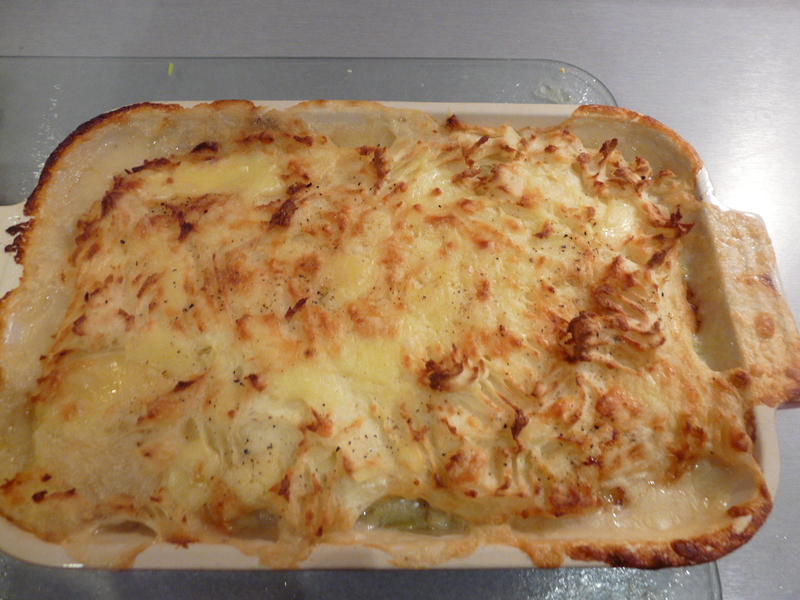 You can see from the photo that fish pie is not really a pie crust at all. 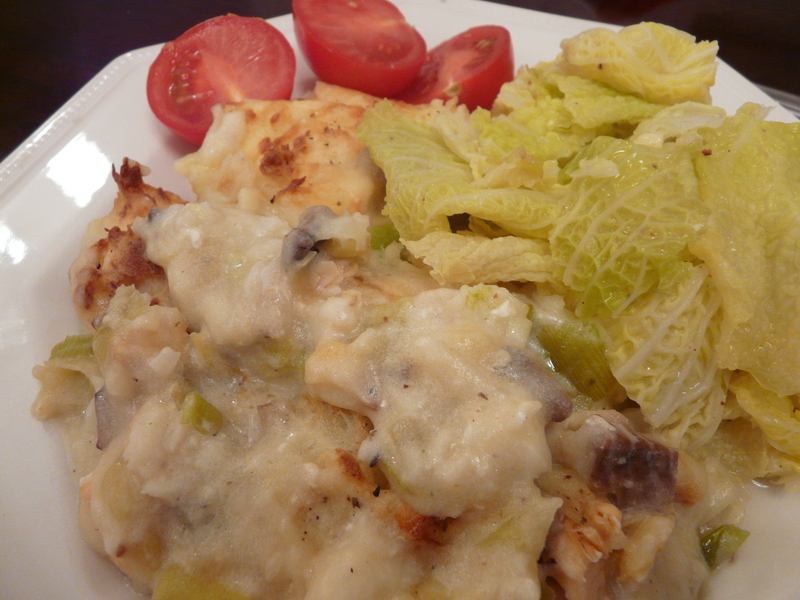 We are talking fish in white sauce, with mashed potato topping. Get the spuds on first. Then the fish (salmon, smoked pollack, and cod). I cooked the fish in the pie dish in the oven at 170 (fan) in half a pint of milk. I added salt, white pepper, some nutmeg and two bay leaves. I covered it with foil so it didn’t dry out. Oh – some knobs of butter scattered over too. After 20 mins, remove from the oven and carefully pour out the cooking liquor. This is now very tasty. You use that to make up the white sauce. (Roux of flour and butter – add the liquor very slowly at first. Then keep mixing it until it boils and thickens). Meanwhile, the spuds are ready to mash (Lovely king Edwards – so versatile). I added butter and creme fraiche. Pour the white sauce over the fish pieces. Add some black pepper and more nutmeg. Spoon the potato on top and drag it level with a fork. Grate some cheddar on to the top. Into the oven again, for 30 mins at 170 (my oven is hot – 180 may be better in other ovens.) I put it on the top shelf, and put a baking tray beneath in case my newly cleaned oven suffered from a white sauce overflow as it expands in the heat. It did. I was smug. Served with some cabbage – 10 days old, kept in the sale drawer of the fridge, and only outer leaves needed to be discarded. We waste as little as possible here! (Loved it – and mouth much better today, thanks!) This is perfect Good Friday fodder. we had it on Maundy Thursday – it fitted with the dentistry!